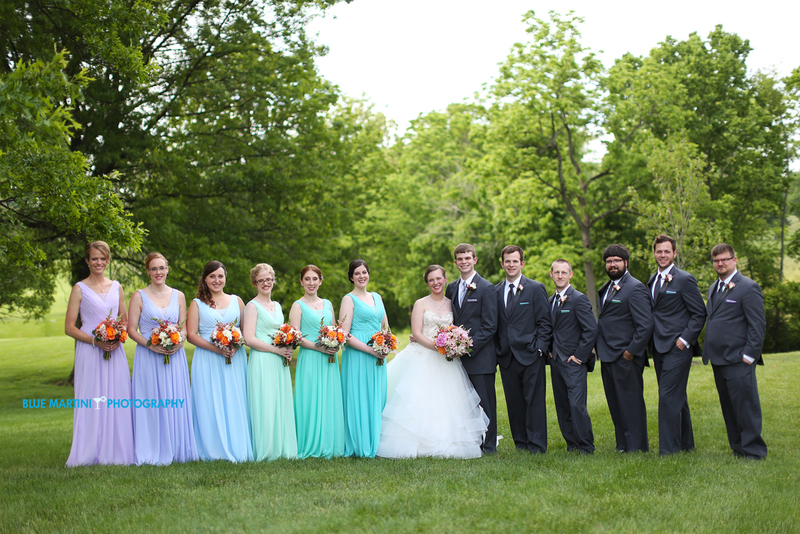 April and Dan tied the knot at the Cooper Creek Event Center in Blue Ash, Ohio. Their wedding didn’t have an exact theme but was centered around the idea of being a joyous celebration for all their friends and family as the couple had been together for 8.5 years before the wedding. 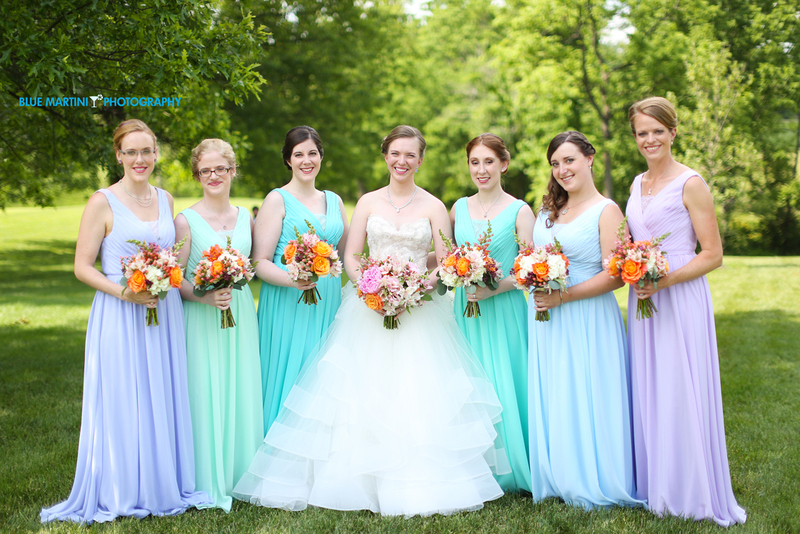 All her ‘maids were wearing our Ellen gown in an array of colors. All photos were taken by Blue Martini Photography. Q: Why did you choose this venue? Q: How did you keep your wedding cohesive without a specific theme? “I wanted the decor to just be very fun and happy and “spring-y” to reflect the celebratory nature of the day. I almost always wear prints (mostly floral), and if I wear solid colors they are always bright and happy, so I wanted the wedding to reflect that. I don’t have a favorite color because I like too many, and while tradition suggests your bridesmaids all wear the same color and you pick a main color for the decor with an accent color or two, I decided that I could pick as many colors as I wanted, as long as I put them together very carefully! We basically ended up with a rainbow wedding with garden party/watercolor accents that suited us perfectly. Q: Any tips for future brides? In the photo where the girls are all to the left of the bride on one side, could you tell me in order what colors they are wearing? Thank you! Isn’t this party just gorgeous?! From left to right the colors look like: Lavender, Mint Green, Spa, Spa, Sky Blue and Lilac. 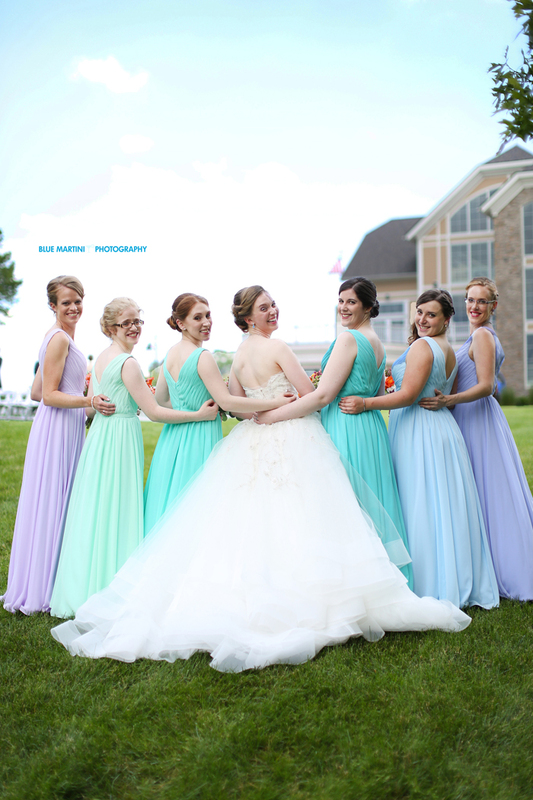 We highly recommend ordering swatches as photography & lighting can throw off the true color of the dresses. Which picture is the order referring to? That’s a good question! 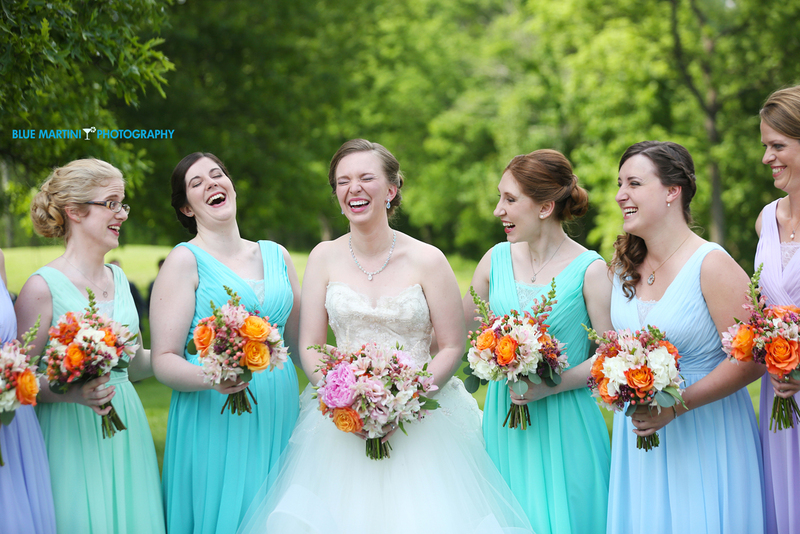 The color breakdown I listed refers to the first image of the bridal party in this blog post.